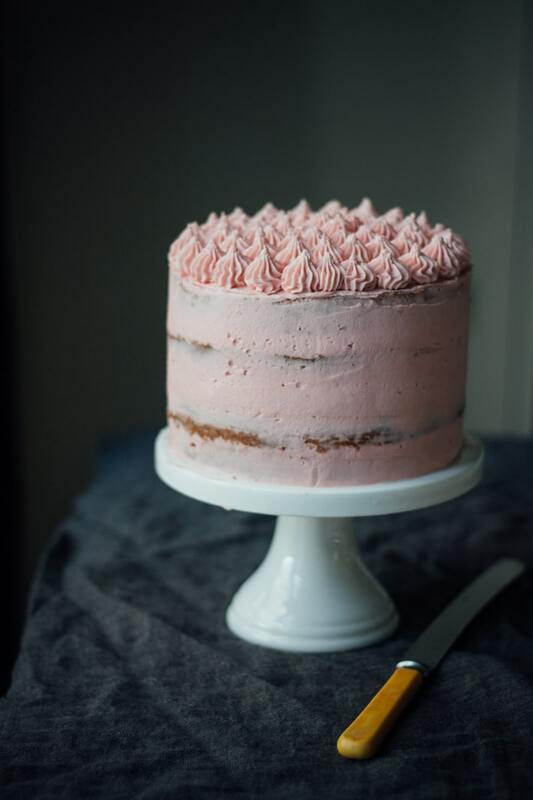 It’s pretty, it’s pale pink, it’s sweet from the roasted plums, it’s tangy from the lime, it’s fluffy from the buttermilk, it’s got beautiful delicate frosting and it looks like it’s made for a princess (albeit a bit of a hipster princess with the semi-naked icing look, but a princess nonetheless). This weekend my little boy Henry is turning two! Guess what? I will not be making this cake for him. He can’t say many words yet, but he can say digger and he’s adamant that’s what kind of party he wants. It’s diggers all the way: digger theme, digger invites, diggers for all his friends and a digger cake, possibly the occasional dump truck or ‘dozer might make an appearance just to mix things up. Before he had his heart set on a digger party he toyed with the idea of a ‘choo choo train’ party or possibly a ‘Batbar’ party. Just to be clear, Batbar refers to his big brother’s hero a.k.a. Batman. Much to Aunty Belinda’s disappointment it wasn’t a new concept for a bar – although I think the kids’ parents and I would have been mighty pleased if that was the angle Henry was going for. Needless to say my pretty Plum and Lime Layer Cake will not be making an appearance this weekend or at any of my little bulldozer son’s parties anytime in the near future. 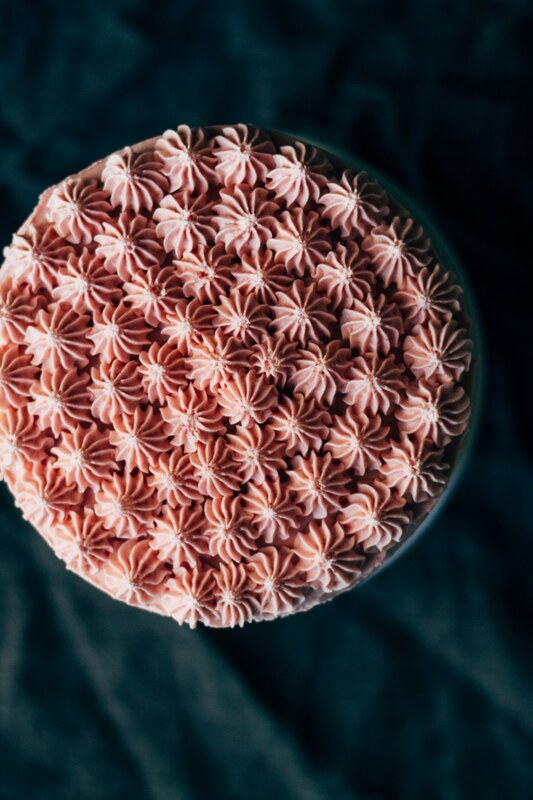 Before you start thinking, no way is this cake making an appearance at my place either (not because it’s getting replaced by a digger cake, but because you don’t have the time or energy to make a fancy layer cake) don’t worry we have options! Option 1: Kids are out with Dad (or possibly they are having a ‘rest’ in front of TV, not that this superstar parent would ever do that, wink), surprisingly the kids slept through the night last night, you’ve had three coffees already today, and you have this rare thing called energy that happens but once a year and you want to embrace it by being a little fancy and creative and attempting a four layer cake with some decorative icing. Option 2: It’s a regular day. F%#k Kate, like [email protected]#l I’m attempting any fancy layer cake. People are coming over. I need cake. Use 2 x 15cm/6in round cake tins. Split each cake in half horizontally to form 4 layers. Fill each layer with a ring of plum frosting around the edge, 2 Tbsp plum icing smeared over the inside of the ring and 2 Tbsp lime curd smeared over the layer of frosting. Repeat 3 times then top with the last layer of cake. Place in fridge for 15-20 min for the layers to firm up. 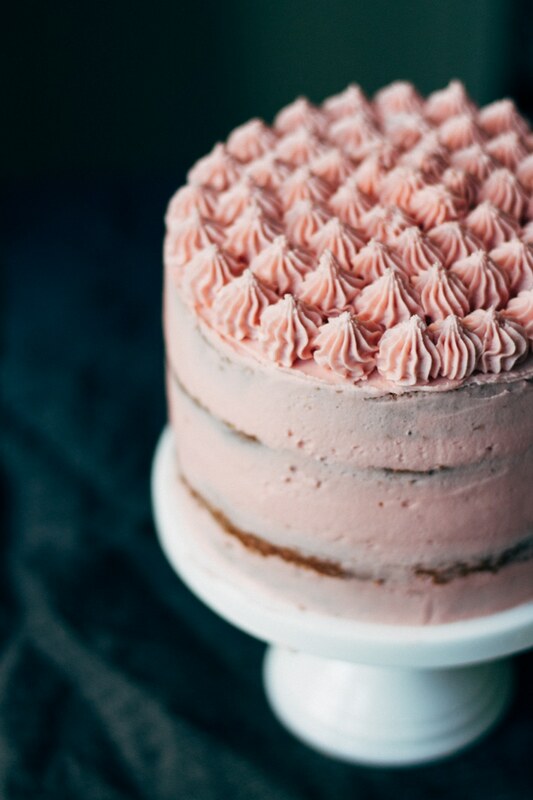 Cover the entire cake in plum frosting (reserving 1 cup for piping on the top). 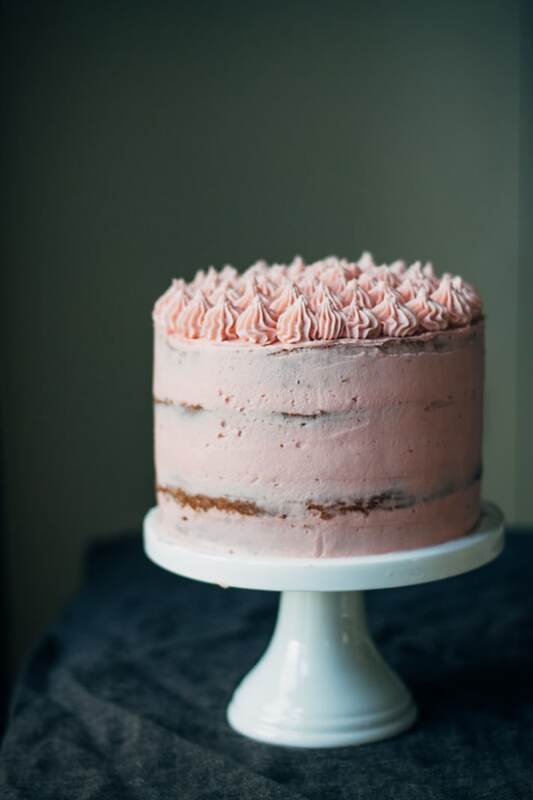 Take a pastry scraper or palette knife dipped in hot water and scrape around the cake to make the frosting smooth and to reveal a little of the cake (to achieve that semi naked cake look). Smooth the frosting on the top of the cake. Fill a pastry bag, fitted with a star tip, with remaining 1 cup plum frosting and decorate the top with piping of your choice. For more details see recipe below. Don’t roast the plums to use in the frosting. Instead just blitz 6 of them with a little liquid from the tin and 2 Tbsp caster sugar in a blender. Use 2 x 20cm/8in round cake tins. Smear 1/3 plum frosting over the bottom cake. Top with 6 Tbsp lime curd (store bought, of course). Cover with the second cake. Top with remaining plum frosting and decorate with some drizzles of lime curd and some freeze-dried plums and edible flowers if you have them. Please tell me you all are just as disorganised as I am when planning parties? 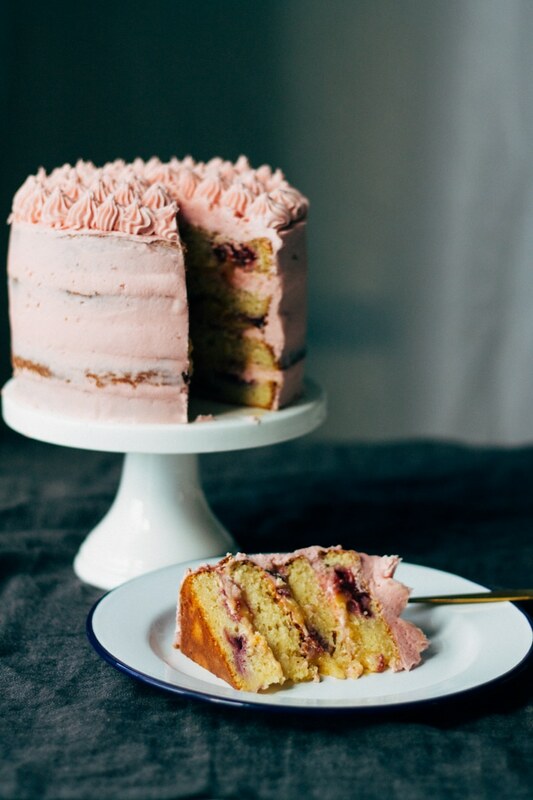 A pretty pink cake with layers of fluffy buttermilk cake, sweet plums and tangy lime curd. 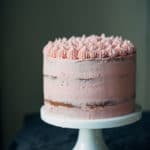 Two options for a 2 layer cake or 4 layer cake. Open can of plums. Place half the plums (6) in a small bowl and set aside. These will be used for the cake. Place the remaining plums and liquid from the tin in a baking dish and sprinkle over 2 Tbsp caster sugar. Place in the oven and bake for 40 min (see note 2). Allow to cool enough to handle. Remove the stones from the plums then, using a blender or food processor, blend the plum flesh and liquid until smooth. Allow to cool completely. Reserve 4 Tbsp for the frosting, the rest can be refrigerated and used on ice cream, porridge, cereal or also nice on a pavlova. While the plums are baking, make your lime curd using my Homemade Lemon Curd recipe but substituting lemons for limes. Alternatively, you can always purchase a jar of good quality lime curd, or even lemon curd. You will only need 6 Tbsp for the cake the rest can be used in other cakes, on top of ice cream, meringues or delicious in little tarts. Grease and line 2 x 15cm/6in round cake tins for 4 layer cake (or 2 x 20cm/8in round cake tins for a 2 layer cake). In a small bowl, whisk together the flour, baking powder and sea salt. Set aside. In another small bowl, combine the buttermilk and vanilla. Cream together the 125g/1 stick butter and 1 cup caster sugar in the bowl of a standing mixer fitted with a paddle attachment for about 5 minutes until light and fluffy. Add the eggs one at a time ensuring they are incorporated after each addition. If the mixture looks like it has curdled just add a tablespoon of the flour mixture. Add 1/3 of the flour mixture and mix to combine. Follow with 1/2 the buttermilk mixture, then second 1/3 of the flour mixture, 1/2 the buttermilk then finally the last 1/3 of the flour mixture. Ensure the mixture is fully combined but do not over mix. Divide batter between baking tins. Take the reserved whole plums, remove the stones and roughly chop. 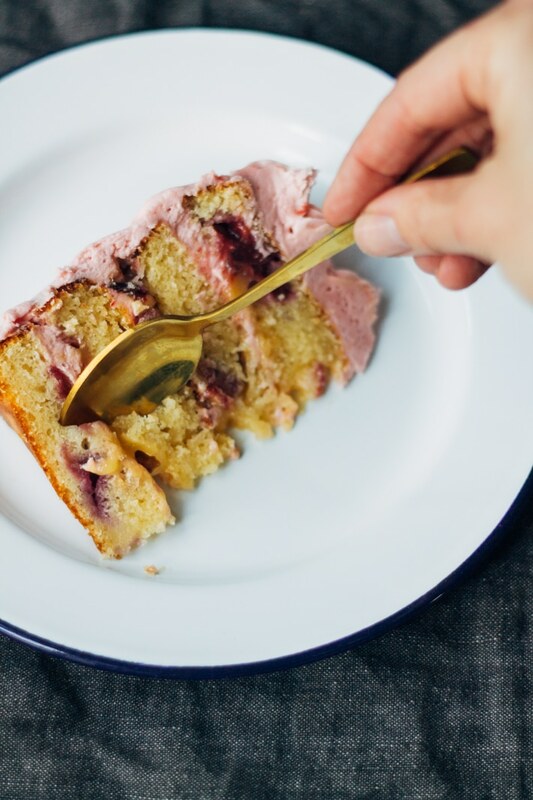 Divide the plums between the cakes, scatter evenly over the tops and gently press down into the batter. I just use my finger for this. Place cakes in the oven for 35-40 min or until a skewer inserted into the centre of the cake comes out clean. If you are using 20cm/8in tins bake for 30-35 min, or again until a skewer comes out clean. Remove from the oven and allow the cakes to cool in their tins for 10 min before turning out on a wire rack to cool completely. Place 200g/7oz butter in the bowl of a standing mixer fitted with a paddle attachment. Gradually add the icing sugar until fully incorporated. Beat for about 5 min until light and fluffy. Add 4 Tbsp blended roasted plum/juice mixture and mix until fully combined. If making the 4 layer cake, spoon 1 cup frosting in a pastry bag fitted with a star attachment and spoon the remaining frosting into a pastry bag fitted with a 1cm circular nozzle (or just snip the end off a ziplock bag). If making a simple 2 layer cake, leave the frosting in the bowl. Take 15cm/6in cakes and place on a flat surface. If you have a dome on the top of the cake then use a knife to remove these and make the tops flat. Then cut each of the cakes in half horizontally to make 4 layers of cake. Place a layer of cake on a plate or cake stand. Pipe a ring around the outside of the cake using the piping bag fitted with the plain circular nozzle. Spoon in 2 Tbsp of frosting to the centre of the layer and smooth to cover the layer. Cover with 2 Tbsp lime curd. Top with the next layer of cake and repeat the process for this layer and the next. Top with the final layer of cake. Refrigerate the cake for 15-20 min to firm up the layers. Cover the cake with the frosting remaining in the piping bag fitted with the circular nozzle. Use a pastry scraper or offset spatula dipped in hot water to run around the sides of the cake and to smooth them. As you scrape reveal a little of the cake to achieve that ‘semi-naked cake’ look. Smooth the top of the cake using the pastry scraper or spatula. Take the piping bag fitted with the star attachment and pipe mounds of frosting on top. Take 1 x 20cm/8in cake and place on a flat surface or plate. Smear over 1/3 of the plum frosting. Top with 6 Tbsp lime curd. Top with remaining 2/3 plum frosting. Drizzle over extra lime curd, freeze-dried plums and/or edible flowers to decorate. Best eaten on the day, but will last up to 3 days in an airtight container. 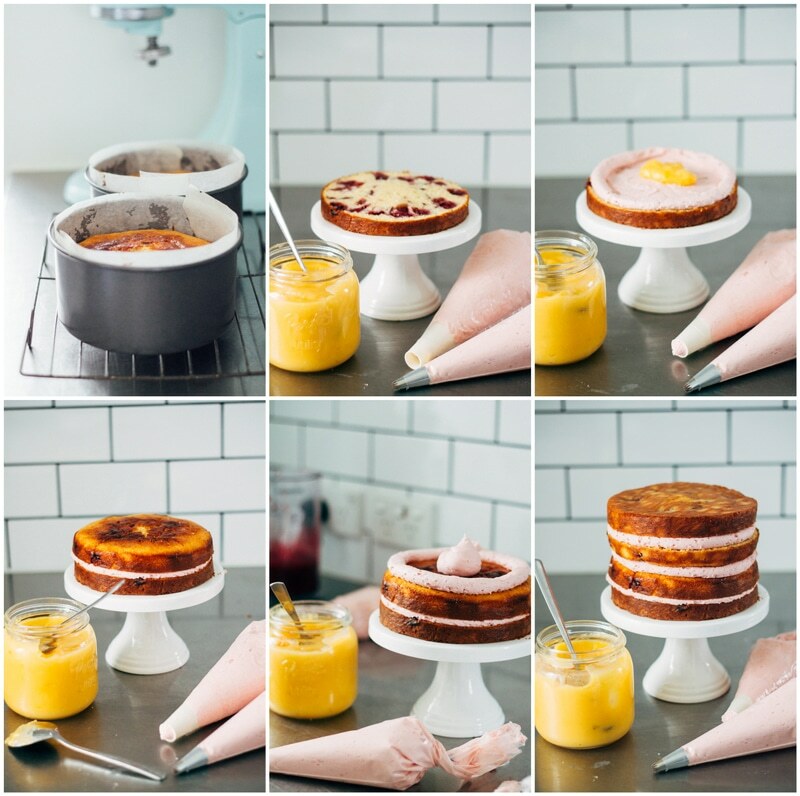 Cakes can be made the day before, stored in an airtight containing, then iced on the day. You can find my Homemade Lemon Curd Recipe here. You can use any remaining lime curd to replace lemon curd in my Raspberry and Lemon Cake, my Plum Choux Bombs or on top of meringues, on ice cream or in little store-bought tarts. Any remaining roasted plum puree can be used on ice cream, pavlova, or even on your porridge or cereal. Thanks so much and thanks for the 5 stars! Thank you so much Alia for your lovely comment! I agree, plums are so delicious, especially the Black Doris ones – they are my absolute favourite! Hi again! I just realized that I forgot to type “favorite” in my first comment – I meant to say that plums are one of my absolute FAVORITE fruits, lol. I don’t know if I have ever had Black Doris plums before! Maybe I have and I just didn’t realize it. Also, last week I was at the market and I tried a “Pluot”, which is a hybrid between a plum and an apricot! It was DIVINE! If you haven’t had one before you should definitely try one! I just had to share that with you, haha. 🙂 Have a great week! I didn’t even notice!! When I read it I thought you’d written absolute favourite fruit. Funny how the mind just automatically fills in the blanks! I will definitely looks out for Pluots this summer. Haha love the name! Apricots and plums are two of the best things about summer so I can’t imagine how wonderful they would be together! Yum!! Thanks for the tip, you have a lovely week too! Omg can i order this for my Birthday then?? Love the flavors, your pics and that pretty pink .